Visiting Munich and seeking to get a place to swim? Nice option! Don't neglect to tell us how did it go. 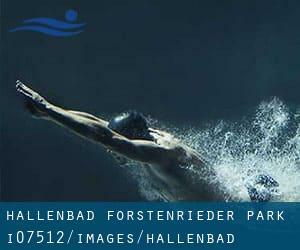 Introducing now Hallenbad Forstenrieder Park swimming pool, an awesome swimming pool sent by a swimmer like you few days ago. Have you visit this pool? Do you work here? Please, contact us when you have knowledge that you think is gonna be useful and don't forget from now on you'll be able to now promote every pool just by sharing this page together with your friends or adding comments in the Facebook boxes below. Come on and help this pool to be the first in Munich! Among all the activities provided by the center, if you are thinking about swimming you can expect to enjoy 25 meters, Indoors. If you will need to contact this Swimming Pool, email address and phone number are both number. If you believe that any with the information and facts is incorrect, please get in touch with us. Help us be better day-by-day. Updated on 2019 Weinbergerstrasse 11 , Munich , GERMANY (Postal Code: 81241). Among all the activities provided by the center, if you are interested in swimming you can enjoy 25 meters, Indoors. If you'll want to get in touch with this Swimming Pool, e-mail address and phone number are both number. Updated on 2019 Heinrich-Wieland-Strasse 24 , Munich , GERMANY (Postal Code: 81734). Swimmers like you reported 25 meters, 6 lanes, Indoors. Phone number and e-mail address are number for this Swimming Pool. Updated on 2019 Klausener Strasse 22 , Munich , GERMANY (Postal Code: 81547). This sports center delivers 25 meters, Indoors. Contact information for this Swimming Pool which include phone number and email address are number. Staffelseestraße 6–8 , Munich , GERMANY (Postal Code: 81477). Among all of the activities offered by the center, when you are interested in swimming you will enjoy 25 meters x 10 meters, Indoors. If you need to contact this Swimming Pool, email address and phone number are both number. Updated on 2019 Valleystrasse 37 , Munich , GERMANY (Postal Code: 81371). Swimmers like you reported 25 meters, 4 lanes, Indoors. Phone number and e-mail address are number for this Swimming Pool. Franziskaner Str. 18 , Munich , GERMANY (Postal Code: 81669). This sports center offers 20 meters, Indoors. For this Swimming Pool, only phone number is number here. Updated on 2019 Postillonstrasse 17 , Munich , GERMANY (Postal Code: 80637). Among all the activities offered by the center, should you be interested in swimming you will enjoy Olympic size, 8 lanes, Outdoors. If you will need to contact this Pool, email address and phone number are both number. Updated on 2019 Schleissheimer Strasse 142 , Munich , GERMANY (Postal Code: 80797). This sports center offers 33 meters x 13 meters, 1 meters - 3 meters depth, 1 meters - 3 meters depth, Indoors. Contact information for this Swimming Pool including phone number and e-mail address are number. Updated on 2019 Cosimastrasse 5 , Munich , GERMANY (Postal Code: 81925). This sports center offers 25 meters, Indoors. Contact information for this Swimming Pool such as phone number and email address are number. Updated on 2019 Olympiapark , Coubertinplatz 1 , Munich , GERMANY (Postal Code: 80809). Swimmers like you have reported Olympic size x 21 meters, Indoors. Also, you will find Olympic size x 12.5 meters, 5 lanes, Indoors. If you will need to contact this Pool, email address and phone number are both number. Arabellastrasse 6 , Munich , GERMANY (Postal Code: 81925). Among all the activities offered by the center, if you are interested in swimming you will enjoy ~20 meters, Indoors. If you must get in touch with this Swimming Pool, email address and phone number are both number. Ungererstraße 175 , Munich , GERMANY (Postal Code: 80805). This sports center offers 25 meters x 10 meters, Indoors. Contact information and facts for this Swimming Pool similar to phone number and email address are number. Updated on 2019 Rosenheimer Strasse 1 , Central /Lehel , Munich , GERMANY (Postal Code: 81667). This great and large sports center lets professional swimmers like you enjoy 31 meters x 13 meters, 0.8 meters - 2.8 meters depth, 0.8 meters - 2.8 meters depth, Indoors. Additionally, within these facilities you can try 18 meters x 11 meters, 0.8 meters - 2.8 meters depth, 0.8 meters - 2.8 meters depth, Indoors. Phone number and e-mail address are number for this Pool. The information and facts of this Pool has been verified recently by a member of their staff.